What is the Market Looking for from Q1? The current rally has taken the S&P 500 78% off the lows of 666.79 to a close of 1,186.44 today. With Alcoa (AA) reporting earnings this coming Monday, traders are wise to pay attention to their report as well as other first week reports. Next week includes Intel (INTC), JP Morgan (JPM), Google (GOOG), Bank of America (BAC) and General Electric (GE). The chart below shows us simply how important the first week of earnings season is for determining the next likely move in stock prices. The first pull-in of this rally came in June 2009 and into July. Alcoa kicked off Q2 earnings season on July 8th, the exact day the market bottomed. The fears of an imminent double-dip were put to rest as companies surprised the Street. Investors realized they had been too pessimistic in their expectations and evaluation of the recovery and smartly bought up stocks. The next substantial turning point came early in Q4 earnings season after disappointed investors sold stocks leading to another 9% pull-in. 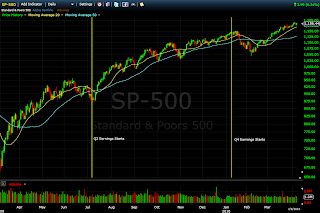 Aloca's report again marked the turn in the S&P, this time the top. Stocks saw many days of selling before investors regained their senses and recognized some of the improvements companies were showing on the whole. Monday begins first quarter earnings season for 2010. 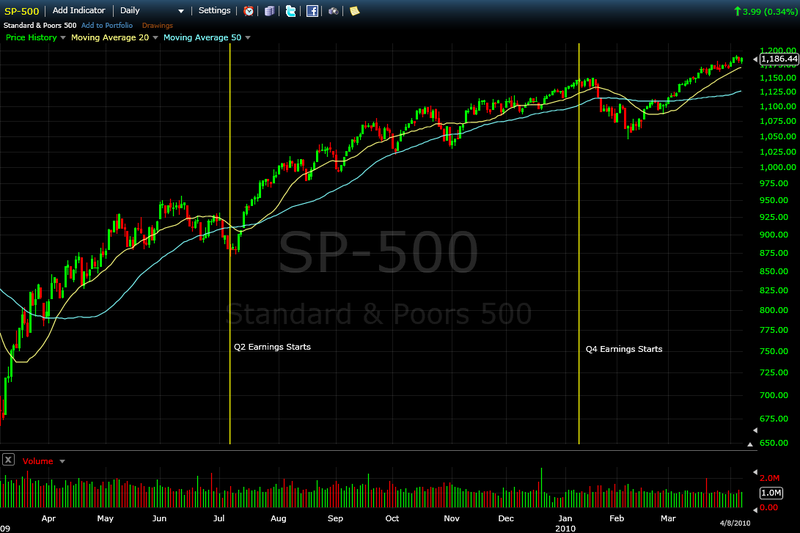 Will it lead to a significant correction? Or will it just provide more fuel to the rally? Clearly, only the numbers will give us an indication. It seems to me that expectations are still too low on for corporate earnings. Cost-cutting has been the key driver of the past few earnings seasons as margins have improved and earnings have rebounded sharply from the depressed levels of 2009. Check out The Pragmatic Capitalist for more detail on this topic. The story for this season will be revenues. The bottom-line has stabilized and picked up nicely yet cost-cutting only takes a rally so far. 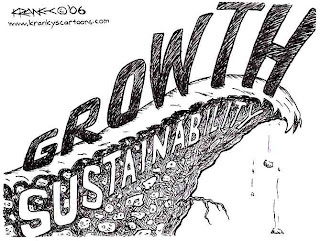 Top-line growth is needed for the upside to be sustained. I expect enough improvement to continue this rally but who knows, it's all about the earnings reported versus the priced-in expectations.